FAYETTEVILLE, Ark. 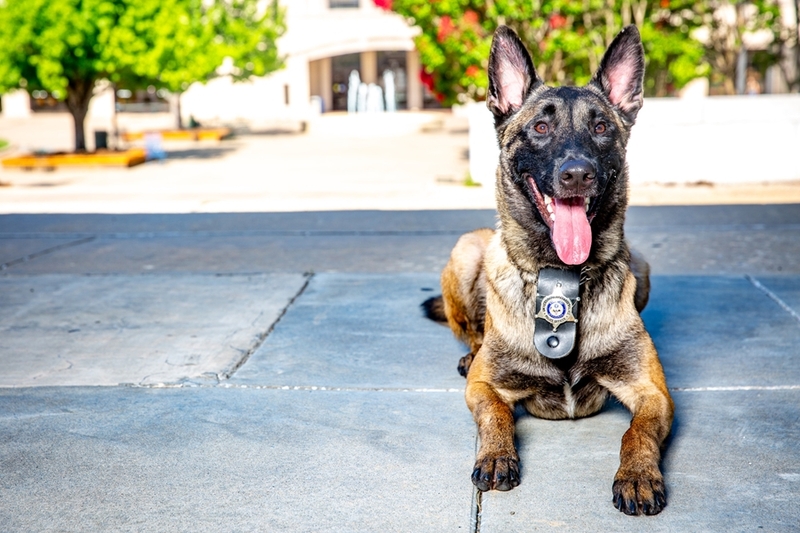 – Rickie is the newest member of the University of Arkansas Police Department’s K-9 squad. He’s a year old Belgian Malinois, trained for narcotics detection and campus patrol. He is replacing Dingo, who retired from the department this year. Rickie was trained and donated to the UAPD – but not named -- by Sgt. Jeff Shetlar, who supervises the four dogs and officers in the UAPD K-9 unit. Rickie was named in honor of a long-time U of A donor – Rick Edwards – in one of the more unusual “naming” agreements at the university. You might even say, one of the nicest. Rick Edwards and his wife are members of the Towers of Old Main, a giving society comprising benefactors recognized for their long history of making substantial donations to the University of Arkansas. Edwards is also an Air Force veteran with a lifetime of connections to the military and law enforcement — most recently his work with the U.S. Marshal Service Museum in Fort Smith. He and his wife founded Triple-S Alarm in Little Rock. And he loves dogs: in his spare time he used to breed Portuguese Water Dogs. Roderick Edwards contacted the UAPD and was put in touch with Director Steve Gahagans. Edwards offered to make a small donation in exchange for “naming rights.” The donatation will be used to help feed and care for the department's K-9 officers. It was an unusual offer – but it wasn’t a tough sell.